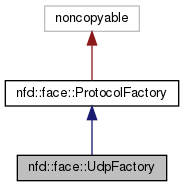 Protocol factory for UDP over IPv4 and IPv6. Definition at line 37 of file udp-factory.hpp. Definition at line 50 of file udp-factory.cpp. Definition at line 44 of file udp-factory.cpp. Create UDP-based channel using udp::Endpoint. udp::Endpoint is really an alias for boost::asio::ip::udp::endpoint. If a multicast face is already active on the same local endpoint, the creation fails and an exception is thrown. always a valid pointer to a UdpChannel object, an exception is thrown if it cannot be created. Definition at line 292 of file udp-factory.cpp. Create a multicast UDP face. The face will join the specified multicast group. If this method is called twice with the same set of arguments, only one face will be created. The second call will just return the existing face. If a UDP channel, unicast face, or multicast face already exists on the same combination of local address and multicast port, the creation fails and an exception is thrown. always a valid shared pointer to the created face; an exception is thrown if the face cannot be created. Definition at line 318 of file udp-factory.cpp. 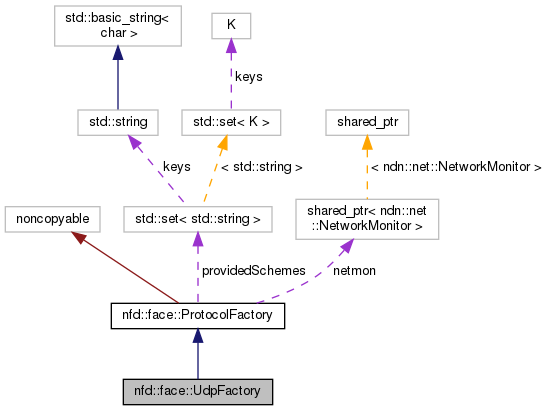 References nfd::face::GenericLinkService::Options::allowCongestionMarking, nfd::face::connectFaceClosedSignal(), nfd::getGlobalIoService(), ndn::net::NetworkInterface::getIndex(), nfd::face::MulticastUdpTransport::openRxSocket(), and nfd::face::MulticastUdpTransport::openTxSocket().